This cleverly concealed escape compass is based on a standard 'suits aircrew' or war service dress (battledress) belt buckle. The central bar of the buckle has a small sliding metal sleeve over it. When this is moved it reveals/releases a small flat metal compass pointer to one side and a pivoted metal fulcrum to the other. The user would balance the pointer on the fulcrum to create a working compass. 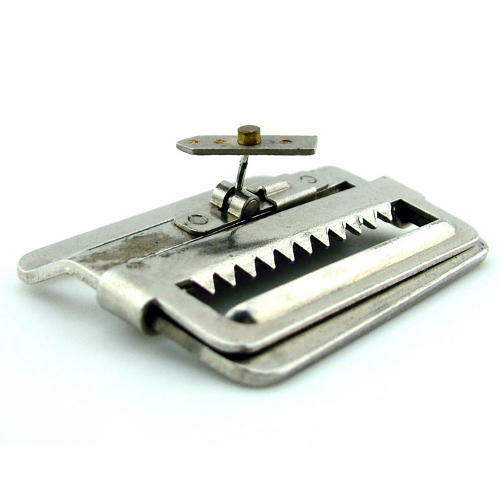 When the buckle was attached to a blouse the actual compass was completely hidden from view such that if an airman POW was searched for anything that might aid his escape, this perfectly innocent belt buckle was usually overlooked. This is one of the rarer and more ingenious of the wartime escape compasses that were developed by Clayton Hutton and his team at MI9. Excellent working condition. Stock code E22506.